I'm an Irish girl, through and through, and Saint Patrick's Day is one of my favorite holidays. I've been proudly wearing these pins on Saint Patrick's Day for years and years. Occasionally, I've even been kissed! It's a tradition at our house to have the entire family gather together for a dinner of corned beef and cabbage followed by a dessert of green frosted cupcakes or cookies. 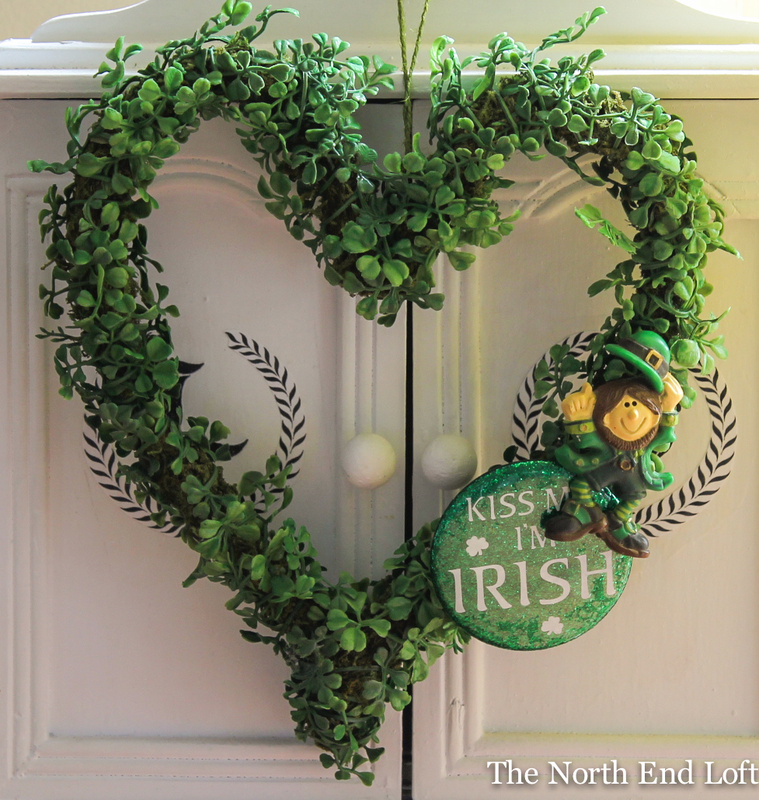 This is the first year I've decorated the house for Saint Patrick's Day. I bought the little pillow, beads, and gold coins at Jo-Ann's Craft Store for half-off. The "biscuit barrel" (which is what a cookie jar is called in Ireland) is Irish Waterford chrystal, a treasured gift from my sister in law. And the stems reminded me of heather plucked from the Irish moors. 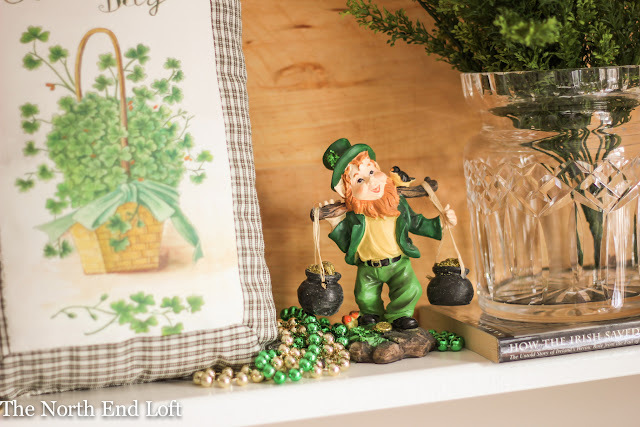 The mischievous grin of this cute little leprechaun caught my eye as I was standing in the checkout line at Hobby Lobby. He gave me a wink, and before I could say, "Blarney!" he magically found his way into my cart! The sixteen inch tall thrift store cupboard sitting on my craft table was painted with homemade chalkpaint and decoupaged with my initials and a design from The Graphics Fairy. 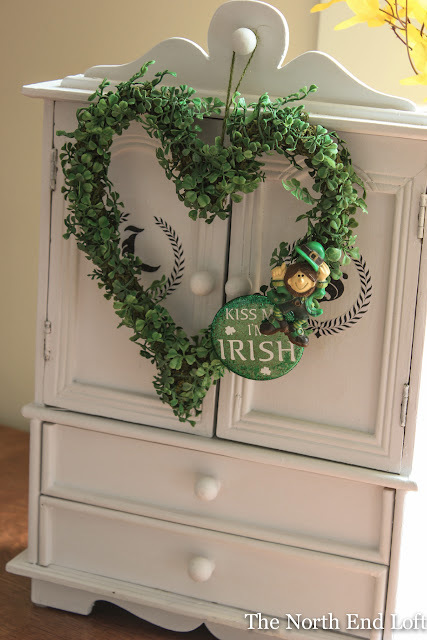 I found this pretty little faux clover heart at Michaels Craft Store. I shop early for the best selection during holidays and only buy craft store decorations when they're at least half off. This one was less than $5.00, and is so versatile I think it was worth every penny. Hanging from my little cupboard, it's the perfect place to display my Irish pins until Saint Patrick's day on on March 17. I hope I get a kiss this year! 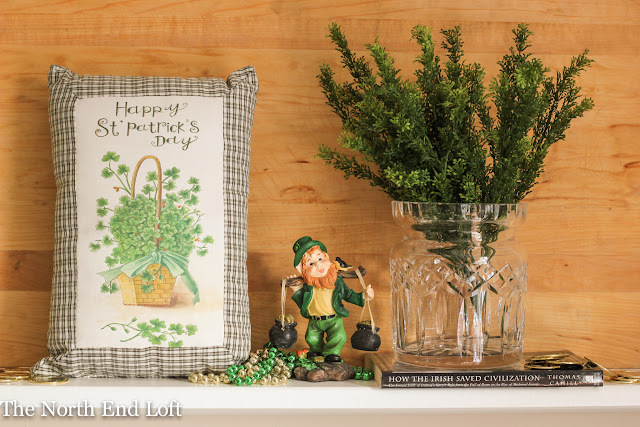 Have a Happy Saint Patrick's Day on Sunday. I'm linking up this week with these great parties! C'mon along with me! 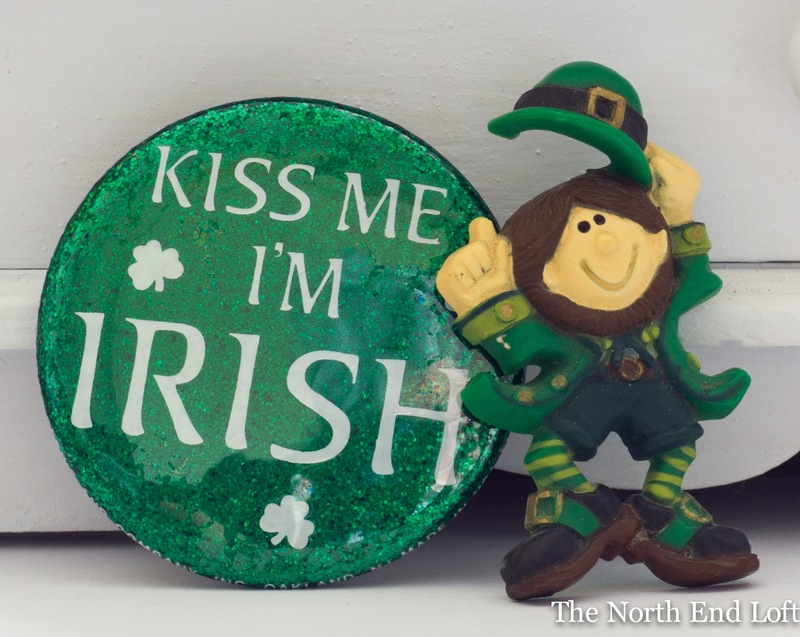 I too am of Irish decent and my Mom was born on St. Patrick's Day! Her father was Irish and her mother French Canadian so she was called Mary Patricia. Her dad was Patrick. I am Patricia and I have a Grandson Patrick who turned 12 today. I hope you get lots of kisses and your decorations are wonderful. 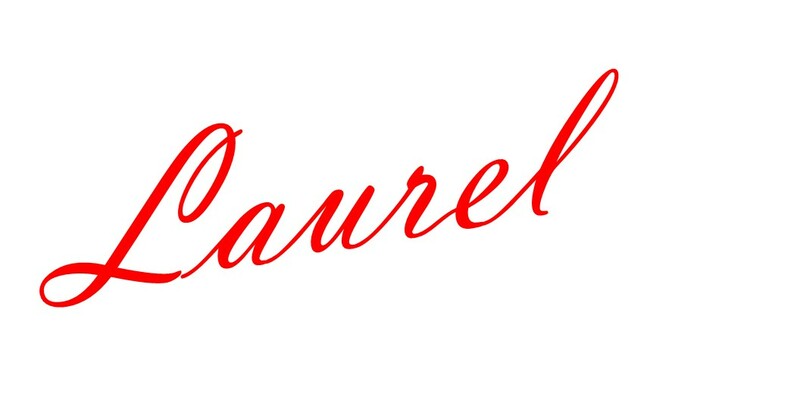 Laurel, I love all your decorations for St. Patrick's Day! Just so pretty, my mom was Irish too. We always celebrated the holiday. Thank you for stopping by with your inspirational comment. I always love hearing from you. Guess what? That bouquet was $5.00 from Trader Joe's. You'll have lots of fun shopping there. Have a wonderful week! Laurel, your St. Patrick's day decor is so pretty! You always have the best ideas! Love your St. Patty's day touches Laurel! Enjoy the day with your family, hope you get that kiss! Someone in my life was born a day before St. Patric's Day. Although it is not a birthday at the same time as St. Patty's Day we still make cakes decorated with green. What a great buy that clover heart was!! Whau! Love the pin and wishing you lots of smooches!! I love your little heart wreath and I realize I have a similar cupboard in the attic that I can fix up. Our lane is very social - it dead ends on the ocean where everyone gathers for sunset. 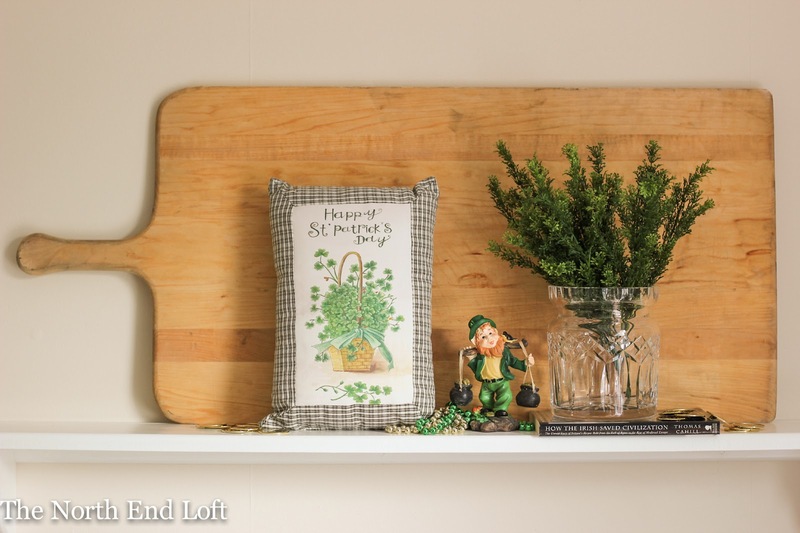 On St. Patrick's Day, the ocean front house brings in Irish dancers and fiddlers and we have a wonderful evening of treats and music. It is a fun holiday to celebrate between our New Year's Even progressive dinner and the Memorial Day BBQ. Hope you get a few kisses on SPD! Such fun and cheerful decor! 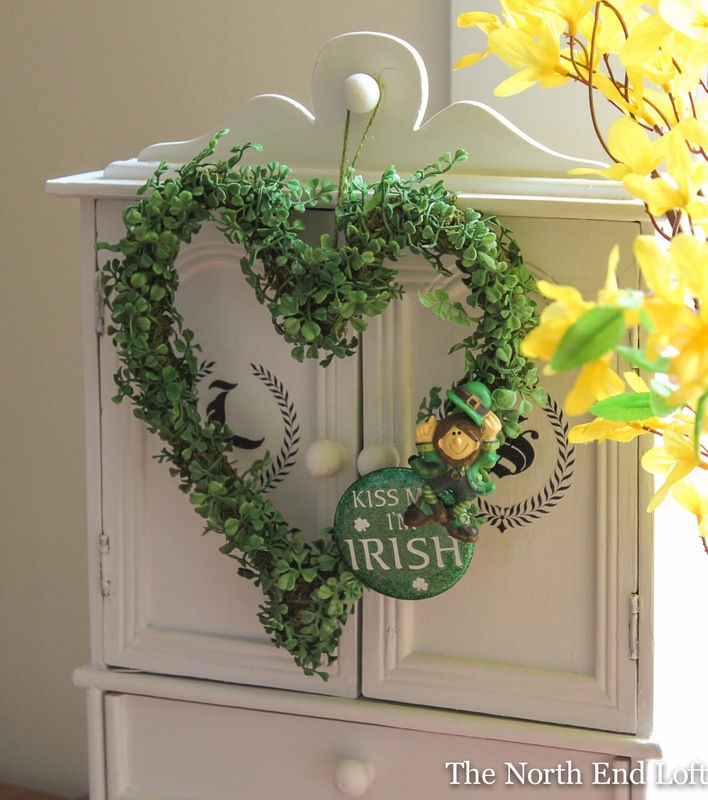 Love that clover wreath- and a steal! visiting from rooted in time! So cute! Love the wreath!